The Seasons, Op. 37a (also published as Op. 37b with the French title Les Saisons), is a set of twelve short character pieces for solo piano. Each piece represents a different month of the year. The work is also sometimes heard in orchestral and other arrangements by other hands. Tchaikovsky did not devote his most serious compositional efforts to these pieces: they were composed to order, and they were a way of supplementing his income. However, he saw the writing of music to a commission as just as valid as writing music from his own inner inspiration… with the difference that for the former he needed a definite subject, a time limit, and the promise of payment at the end. 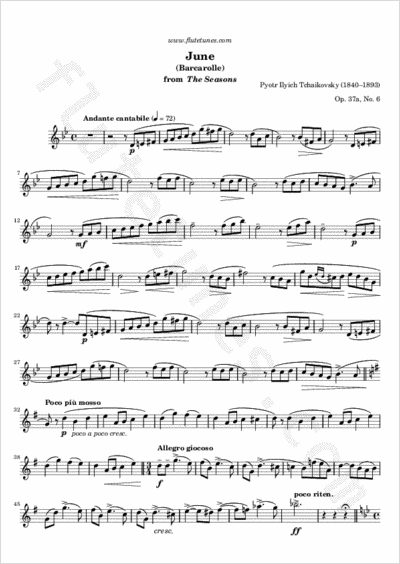 Most of the pieces are in simple ABA form, and each contains a minor melodic masterpiece. “June (Barcarolle)” is arguably the most famous piece from the set.